YouTube video views, Facebook "likes" and Blogger visits are among activities GCHQ has monitored in real-time, according to the latest Snowden leaks. Details of an alleged GCHQ programme codenamed Squeaky Dolphin have been published by NBC News. It reports that the UK intelligence agency showed off its abilities to the US National Security Agency in 2012. 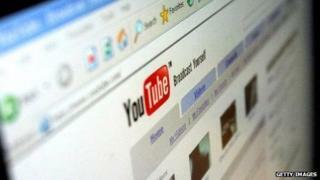 Facebook has since started encrypting its data, but Google's YouTube and Blogger services remain unencrypted. Both firms have said that they did not give GCHQ permission to access the data. The alleged operation's leaked logo - showing a dolphin holding a canister branded GTE - appears to refer to Global Telecoms Exploitation, a GCHQ division believed to be capable of collecting data from fibre-optic cables. According to an earlier leak, published by the Guardian, GCHQ has been tapping fibre-optic cables to create a "buffer" of information it could search through since at least 2011, as part of a scheme called Tempora. The paper said that by 2012 the agency had tapped more than 200 cables - including transatlantic communication links - and was able to process phone and internet data taken from up to 46 of them at a time. However, the prime minister has previously said that: "I'm satisfied that the work these agencies do is not only vital but is properly overseen." The NBC report is based on a presentation entitled Psychology: A New Kind of Sigdev [signals development]. It was part of the trove of documents former NSA contractor Edward Snowden passed to journalist Glenn Greenwald, who contributed to NBC's report. Splunk is commercially available software designed to let organisations "listen" to their own data. "We have long been concerned about the possibility of this kind of snooping, which is why we have continued to extend encryption across more and more Google services and links," a spokesman for Google told the BBC. "We do not provide any government, including the UK government, with access to our systems. These allegations underscore the urgent need for reform of government surveillance practices." A spokesman for Facebook added: "Network security is an important part of the way we protect user information, which is why we finished moving our site traffic to HTTPS [encryption] by default last year, implemented Perfect Forward Secrecy, and continue to strengthen all aspects of our network." US and UK officials have stressed that while they may scoop up a lot of data, their actual use of it is targeted. Media captionDavid Drummond, Google Chief Legal Officer on Edward Snowden's revelations that the NSA hacked Google data: "I was shocked, surprised and outraged"
"All of GCHQ's work is carried out in accordance with a strict legal and policy framework which ensures that our activities are authorised, necessary and proportionate, and that there is rigorous oversight, including from the secretary of state, the Interception and Intelligence Services Commissioners and the Parliamentary Intelligence and Security Committee," a spokeswoman from GCHQ said.